The quickest cure for lack of sleep is to watch New York Ranger and New York Islander prospects in action as someone or some team will find a way to make you smile. Now let's start off by seeing who earned our first star for the first Saturday evening of the 2nd half. If you picked Anthony Duclair (NYR 2013 3rd) of the Quebec Remparts then you are either a really loyal reader or you cheated and peeked. If you want to talk about getting off to a good start to the 2nd half of your season then boy will you like what the Duke did. The Duke was 1-3-4 to lead his Quebec Remparts to a 5-4 overtime win over the Rimouski Oceanic. The Duke got his night going by setting up defenseman Cody Donaghey for Donaghey's 4th goal of the season which was a power play goal at 7:48 of the second period and tied the game up at 1-1. 52 seconds later it would be Duclair giving the Remparts a 2-1 lead when he converted on his 30th goal of the season at 8:40 on an even strength goal. The Oceanic and Remparts would trade goals to finish the 2nd period with a 3-2 score favoring the Remparts. In the 3rd period, Duclair would earn a secondary assist for his 3rd point of the night giving the Remparts a 4-2 lead just 46 seconds into the 3rd period. It would not be enough as the Oceanic would rally for 2 goals to tie the game and force it to overtime. Overtime though would be where the Duke would once again help the Remparts as Duclair's 4th point of the night would be setting up linemate Kurt Etchegary for a power play goal at 2:25 and a 5-4 overtime win. Duclair with his 3rd four point game of the season helped the Remparts pull to within 2 points of the Oceanic in the QMJHL overall standings and 2 points for 2nd place in the Telus Eat Division with the Remparts holding a game in hand. Duclair was named the game's 2nd star as he improves to 30-25-55 on the season. The 2 teams will be taking each other on again Sunday evening. Nothing tells you about the fight inside a young goalie than watching him go from playing a horrible game the night before, get on a bus and ride it all night then just flat out steal a game. That is exactly what Skapski did as he stopped 36 out of 37 shots to help his Kootenay Ice earn a 2-1 win over the Spokane Chiefs. Mackenzie Skapski (NYR 2013 6th) was named the game's first star by the Spokane folks as he made a 2-0 first period lead stand up to give Kootenay 2 badly needed points in their hunt for a playoff spot in the WHL's Eastern Conference. The Ice are fighting 5 teams for 4 playoff spots and the bad news is the Ice are in the middle of the pack with every other team holding games in hand. The Ice badly need Skapski to go on a hot streak after a very inconsistent 1st half. The win gives Skapski a 10-10-2-1 record with a 2.87 goals against and a 0.910 save percentage. Brady Skeji (NYR 2012 1st) doesn't have to score any goals to get people talking about him as they were after his defensive efforts to help Team USA defeat Slovakia 6-3 to go 2-0 in Group A play at the World Under-20 Championships in Sweden. Now look real close at the picture and find the puck. Now come on if that doesn't make you smile to see this kid's effort then boy you are hard to please. 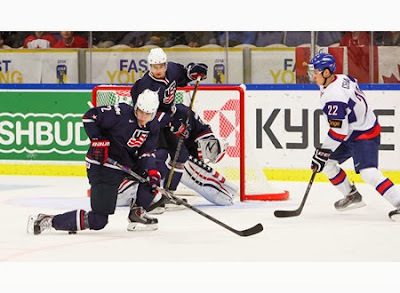 Russia with 2013 New York Ranger 3rd round pick Pavel Buchnevich playing on their top line had no trouble defeating Switzerland 7-1 in Group B play. Buchnevich had an assist on Russia's 7th goal of the game for his 3rd assist in 2 games. And we have the annual freakout going on up north as Canada (GASP NOOOOOOOOOOOO) lost to the Czech Republic 5-4 in Group A play. Adam Pelech (NYI 2012 3rd) was scoreless as the Czech Republic defeated Canada for the first time ever as the Czech Rebuplic (They last defeated Canada when they were part of Czechoslovakia in 1993). So why the Canadians freak out, it was just a overtime loss which means the Canadians are 2 points behind Team USA for 1st place in Group A.
Loic Leduc (NYI 2012 4th) was traded from the Cape Breton Screaming Eagles to the Rimouski Oceanic for a 2014 2nd round pick in the QMJHL draft. The move gives the Oceanic one of the biggest bluelines in junior hockey as the 6'6 Leduc joins 6'7 Samuel Morin and 6'5 Beau Rusk. 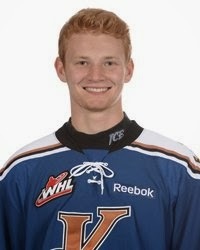 In his first game as a member of the Oceanic, Leduc wearing #71 was a -2 on 1 shot with 2 minors. Ryan Graves (NYR 2013 4th) was scoreless on 4 shots and a +1 as his Charlottetown Islanders shutout the Acadie-Bathurst Titan 4-0. It was a badly needed win for the Islanders as they won for just the 2nd time in their last 10 games. Jesse Graham (NYI 2012 6th) must have thought he was reliving the first half of the season with the Saginaw Spirit with the only assist on the Spirit's only goal. The Spirit lost to the Windsor Spitfires 4-1 for their 4th straight loss and you can't blame Graham for he is is 0-10-10 in the last 10 games (Spirit are 1-7-2). It took 36 games and the holiday break for Troy Donnay (NYR 2013 UFA) and his Erie Otters to lost 2 straight games but they did getting whipped 6-2 by the Kitchener Rangers. The Otters had a 2-0 lead before the Rangers would score 6 times for the win. Donnay was scoreless with a -1 and a minor for "checking from behind" that the Rangers cashed in on for a power play goal. 24 hours later, the winning team still scored 8 times to earn the win but for Kyle Burroughs (NYI 2013 7th) and his Regina Pats, the 8-4 win over Ryan Pulock (NYI 2013 1st) and the Brandon Wheat Kings took the sting from Friday's 8-0 loss to the Wheat Kings. Burroughs didn't score but took a minor for boarding while Pulock had an assist on Brandon's 4th goal but by then it was way over. Cristoval Nieves (NYR 2012 2nd) and his Michigan Wolverines normally use the Great Lake's Shootout as their launching pad for their 2nd half. Not this year as the team that was ranked 3rd entering the 2nd half was shutout 3-0 by Michigan State to drop the consolation game. Nieves once again had Michigan's best scoring chance of the game but when you lose it doesn't matter. Eamon McAdams (NYI 2013 3rd) did not even dress as his Penn State Nittany Lions were spanked 8-2 to lose the 3 Rivers Classic Finals.